Are you looking for ways to leverage corporate partnerships as a way to enhance the fan experience at your ballpark? Are you looking for ways to tie in corporate partners to team mascot initiatives? Kalahari Resorts, recently teamed up with the Milwaukee Brewers to enhance a gameday attraction at Miller Park. 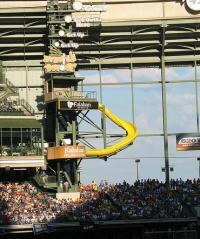 Kalahari unveiled the "Kalahari Splash Zone", a new landing area at the bottom of the team mascot's (Bernie Brewer) slide. The in-venue element, which is viewable to all fans in attendance, serves as a tremendous branding play that captures the attention of Brewers fans both in attendance and those watching on television. Each time the Brewers hit a home run, Bernie Brewer travels down the slide into the Kalahari Splash Zone, where he is met with an explosion of water shot into the air. The slide experience reflects the type of attractions offered at Kalahari Resorts, the Official Water Park of the Milwaukee Brewers. Kalahari's Splash Zone integration is unique in that a number of organizations have aligned with theme park destinations to offer ticket discounts and Kids Get in Free passes for kids, but few have yet to feature interactive in-venue elements. It would not be surprising to see other organization's model this concept.